Among the excellent podcasts and programming brought to you by the Nerdist empire and it’s founder/emperor Chris Hardwick lies an odd little webseries I stumbled upon thanks (once again) to a Tumblr gifset. It’s by no means obscure. In fact, it centers around beloved superstar and former child doctor Neil Patrick Harris. That is, Neil Patrick Harris and a bunch of puppets. The series is called Neil’s Puppet Dreams and it features Harris as a (probably) fictionalized version of himself who struggles with a debilitating form of narcolepsy that results in bizarre dreams involving puppets. So far, there are seven episodes, with each one beginning with Neil unceremoniously passing out and waking up into a variety of wacky situations involving puppets and humans alike. The show doesn’t hold back in its eccentricities and it may not be suitable for younger viewers, as the dreams sometimes stray into uncomfortable territory (one memorable dream resulted when Harris fell asleep watching NBC’s To Catch a Predator). With his fantastic comedic timing, Harris makes his dreams both as hilarious and as creepy as one expects when puppets are involved. Along with his felted friends, Harris is joined by his partner David Burtka, who often appears in pre-dream and post-dream segments. Burtka plays his deadpan, snarky husband role perfectly, at one point explaining to Neil that he left him asleep on the floor so he could have the bed to himself. Burtka seems to be unimpressed and unaffected by Harris’ frequent narcoleptic episodes, which adds to the surrealism of the series. Some of his funniest moments just involve him watching Neil keel over, a look of complete indifference on his face. Neil’s Puppet Dreams also boasts several inspired cameos, including Nathan Fillion, Joe Manganiello and drag superstars William Belli and Detox Icunt. The series itself is created by the eponymous Jim Henson Company and features a variety of puppets played to perfection by the various puppeteers that bring them to life. 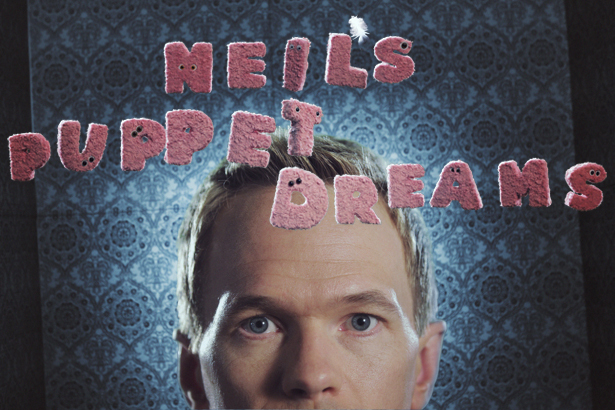 If you’re in to puppets, Neil Patrick Harris, the Nerdist channel or any combination of the three, I highly recommend Neil’s Puppet Dreams. It’s a relatively short commitment (at least until they make more) and it’s offbeat humor and puppet nonsense make it worth every second.